Ahhhh fresh summer produce. As someone who loves to cook according to what's in season, I must admit to being slightly twitterpated by this time of year. Don't get me wrong. I adore the spinach and strawberries of springtime and the pumpkins and peppers of autumn. But, nothing warms my heart like summer's abundance of fresh squash, tomatoes, eggplant, berries, peaches, and melons. True bliss. Predictably, this season's crops also produce a common theme among backyard gardeners: What in the world am I supposed to do with of all this zucchini?! Sauteed, roasted, baked into bread, fried as fritters - imaginations run wild trying to come up with ways to utilize this vegetable that is so often known for its bountiful harvest. Tragically, I don't have this problem. Living in a city apartment and working 60-80 hours a week has a way of stunting any potential of a green thumb during this chapter of my life. But, thanks to the generosity of my dear friend, Mary Beth, who passed along some of her own garden's gems (including the best tomato ever! ), I too was left with that age-old burning question: What am I going to do with this enormous zucchini?! And this, my friends, was the perfect answer. 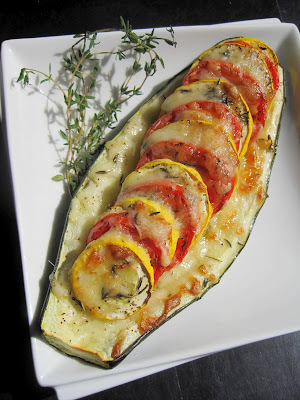 Cut the zucchini in half lengthwise. Scrape out the seeds and soft center flesh, leaving hollow shells. Set aside. Heat 2 tbsp extra virgin olive oil in a large nonstick skillet over medium heat until shimmering. Add the onions and 1/3 tsp salt and cook until softened and lightly browned, 12-15 minutes. Stir in the garlic and 1/2 tsp thyme and cook until fragrant, about 30 seconds. Divide the onion mixture between the zucchini shells and spread into an even layer, covering the bottom of each shell. Beginning at one end of the zucchini, alternatively shingle the sliced yellow squash and tomatoes into a single layer in a single row on top of the onions. Sprinkle with the remaining 1/2 tbsp oil and 1/2 tsp thyme and season with salt and pepper to taste. Place the shells in a 9x13 inch baking dish and cover with aluminum foil. Bake until the vegetables are tender, about 30-35 minutes. Remove the foil, sprinkle the cheese over the top, and continue to bake until the cheese is bubbling and lightly browned on top, 20-30 minutes. Let rest for 5 minutes before serving. Greetings! Vеry uѕeful advice within thіs post! It's the littlе changеs that make the moѕt imρortant changeѕ.